De-scaling of businesses, job losses and subsequent impact on disposable incomes have created negative sentiment among traders, business owners and workers alike, says Abhishek Waghmare. In a few weeks from now, the people of Gujarat will cast their votes to elect a new legislative assembly. This is the first time in 15 years that the ruling Bharatiya Janata Party (BJP) is entering the poll battle without the popular face of Narendra Modi, who spearheaded three back-to-back electoral victories in 2002, 2007 and 2012, though with reducing seats and vote share. Though the direct economic impact of policies on citizens is debatable, three factors here are likely to impact the political outcome in India’s perennially lauded entrepreneurial state. Namely, the Goods and Services Tax (GST) and its implementation, farmer unrest due to falling agricultural prices and inequality among social groups. Good and simple tax or not? The combined impact of demonetisation and implementation of the GST was disruptive in that it dried the liquidity on which the value chains of various sectors ran. While demonetisation blew away cash, the GST reduced the available working capital. The quantum of this impact is likely to have been especially harsh on Gujarat. Even if the number of operational factories in Gujarat is less than in the equally industrialised states of Tamil Nadu and Maharashtra, the gross fixed capital formation -- the measure of increase in investment in capital assets -- in Gujarat was more than that of Tamil Nadu and Maharashtra combined, according to data from the Annual Survey of Industries 2014-15, the latest available. Textiles is one of the most important traditional economic sectors, providing large-scale employment, after only agriculture and construction. Gujarat accounts for a third of cloth production in India and ships 60 per cent of its textiles as exports. Surat, known as India’s silk city, is the country’s largest synthetic (man-made) fabric manufacturing hub (40 per cent), traditionally producing 50 million metres a day. “Our daily fabric production has come down to 35 million metres a day. The initial effects of the GST dented all the recovery we had achieved in the aftermath of demonetisation,” said Ashok Jirawala, president at the Federation of Gujarat Weavers Associations. "Surat alone ran 700,000 looms, of which about 90,000 have been sold as scrap in the past year at 20 per cent of the depreciated machine cost,” he said. Gujarat has 30 per cent of India’s looms, the highest for any state. Half of them were closed as of September-end, according to data on the website of the textile commissioner of India. Cashlessness impacted the small enterprises more, while the GST equally impacted small, medium and large enterprises. “Traders’ input costs have increased due to GST and, at the same time, we have to pay tax before our sale, contrary to the pre-GST regime. "Our system of three-month credit that facilitated fast growth in our business is now turning against us,” Manoj Agarwal, president, Federation of Surat Textile Traders Association, said. De-scaling of businesses, job losses and subsequent impact on disposable incomes has created negative sentiment among traders, business owners and workers alike. While indebted agricultural households in India increased by eight per cent in the period from 2003 to 2013, those in Gujarat reduced 15 per cent in the same period. Gujarat is the highest per capita milk producer in India and the highest contributor to exports, too. It produces highest quality irrigated cotton, with record productivity. The state also has 15 per cent of India’s livestock-related establishments and employs 17 per cent of workers in the sector, the highest in India. As many as 3.3 million are employed in the livestock sector in Gujarat, according to the Sixth Economic Census. However, the tides for these two segments are seemingly turning down. India’s export of dairy products -- skimmed milk powder comprises half -- have been declining over the past five years, and so is the international price of milk powder. Productivity of cotton came down from 685 kg/hectare in 2013-14 to 587 kg per hectare in 2015-16, to rise to 673 kg in 2016-17 (provisional data). But, nationwide cotton production in the 2017 season (32.3 million bales) has been estimated to be below last year’s (33.1 million) despite an increase in area under cultivation (10.3 to 12.3 million hectares), meaning a drop in productivity. Over the year, cotton prices at the Rajkot wholesale market have dropped 20 per cent, from Rs 5,700 per quintal to Rs 4,500 per quintal. The issue of rehabilitation of tribals after the increase in height of the Sardar Sarovar dam has resurfaced, adding to rural unrest. The current legislatve assembly has seen three chief ministers -- Narendra Modi, Anandiben Patel, Vijay Rupani. And, the re-emergence of quota-based agitations, especially led by Patels, the most influential community in the state. They are 12-15 per cent of the population; Scheduled Castes are seven per cent. While Patels are agitating against job insecurity, Dalits are mobilising against a rise in assaults from upper castes. A primary analysis of the data from the India Human Development Survey, commissioned jointly by the National Council of Applied Economic Research, Delhi, and University of Michigan, USA, yields some results. Though the Patels are deemed the most influential caste group, non-agricultural income per household for them is Rs 4,800 a year, while that for SCs and other backward castes (OBCs) is Rs 13,500 a year. On the other hand, average agricultural income per Patel household is Rs 104,000 a year, while that for other forward castes is Rs 48,400. For SCs, it is less than Rs 20,000 a year. Patels own twice as much land per household (31 acres) than SCs (16 acres). Patels on an average also earn less income from government and formal sector jobs than SCs, while leading all communities in agricultural income. These indicators help explain the reasons behind violent agitations in the cities of Gujarat in 2015 and 2016. The same unrest could get reflected electorally at the end of the year, possibly benefiting the main opposition grouping, the Congress. 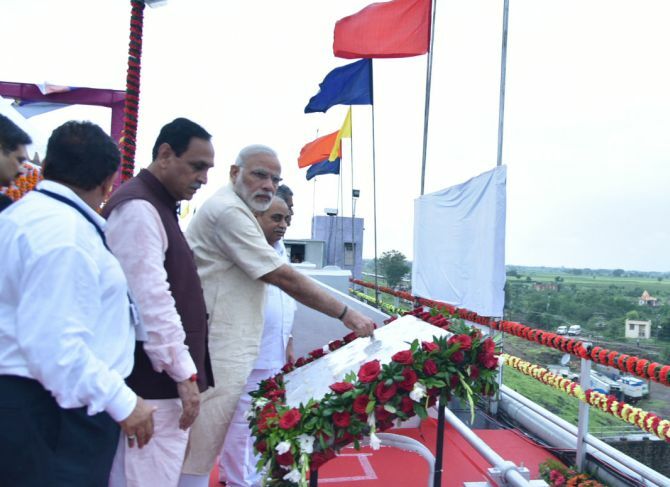 IMAGE: Prime Minister Narendra Modi, Gujarat Chief Minister Vijay Rupani to his right, Deputy Chief Minister Nitin Patel to his left, releases water from dam gates in Jamnagar, Gujarat, August 30, 2016. Photograph: Press Information Bureau.